Guess what I did last week? I visited Cutting Edge Stencils with some of my fellow DIY blogger friends from Hometalk! Please note: this is an image-heavy post, but there’s so much I want to share with you, including several stencil tips (straight from the owners of Cutting Edge Stencils) and links to several of their stencils shown in the photos. There’s also a link to a special giveaway at the end of this post too! Ok, ok, I know: you have questions! Let’s get them out of the way! What exactly is Cutting Edge Stencils? A stencil company started in 2009 by two artists – Janna Makaeva and Greg Swisher – who have extensive professional experience as decorative artists, having run their own very successful decorative painting company, Spec Fin Designs for many years. 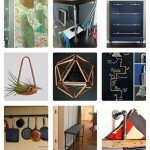 To see some of their incredible work, click on the link in the previous sentence. 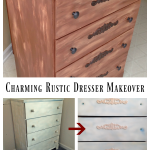 Their mission is to inspire their customers to create beautiful surroundings with simple paint techniques and stencils. I think their artistic background comes through in every stencil design Janna and Greg create. 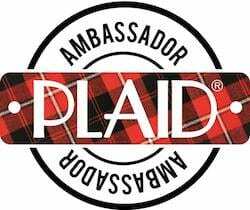 Being they are not only an American company but also a New Jersey company is a huge plus in my book. No, I haven’t actually written a book yet, but I’m writing myself a note right now to make sure to include this. Left to right: Me, Evelin of Sweet Song Bird, Kelly of Eclectically Vintage, Miriam of Hometalk, Jenny of Days of Chalk and Chocolate, Jen of City Farmhouse, Laura of Finding Home, Janna of Cutting Edge Stencils. A bunch of us Hometalk bloggers met up last Friday at Cutting Edge Stencils for a day of fun and learning. Although I had met a few of these gals via Google Hangouts, I had yet to meet any of them in person. And I must tell you, if you think you have bonded with a kindred spirit in your niche online, just wait until you meet them in person. A whole new level of connecting. And the start of what I know will be some wonderful friendships. These three panels are displayed in the comfy lounge area at Cutting Edge Stencils where we all met. Each panel was painted, stenciled, and then another stencil (the Dandelion Stencil) was applied over all three panels to tie them together visually. Notice how the dandelion seeds blow from the flower heads onto the far right panel? Love that! This display showed off several wall stencils in various color combinations. This image shows the Birch Forest Allover Stencil (on the left) and the Japanese Maple Branch Stencil (on the right). My husband and I are thinking of using the Birch Forest Stencil in our breakfast room. Yes, I’m adding that to our never-ending list of projects! We couldn’t help stopping in our tracks – literally – as we stepped onto this gorgeous stenciled sisal rug in the Cutting Edge Stencils office area. This is the Shipibo Allover Stencil. Janna and Greg and their staff put together a hands-on workshop for us. 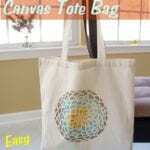 We each stenciled blank canvas totebags as an introduction to stenciling. I chose the Zinnia Stencil. I’ll have a separate post for you here on Thursday with step-by-step details so you can learn how to stencil your own totebags. Next it was time to discuss stenciling walls. The first step is masking off those areas that you don’t want to paint. Janna had a great tip: wear the roll of painter’s tape like a bracelet, and simply pull off and tear the tape as you go. Easy! Cue the trumpets, for it’s time to show you how we used the new Charlotte Allover Stencil Pattern. This is one of Cutting Edge Stencils’ newest designs, and has fast become one of their most popular ones too. We were all ooohing and aaahhing (actual words!) over the fact that we were getting to try out this particular design! You can enter to win your own copy of this stencil – details at the end of this post. When stenciling a wall, start with your stencil at the uppermost corner, as shown below. With Cutting Edge Stencils, you simply need a few pieces of painters tape to attach the stencil to the wall. No spray adhesive is necessary. What could be easier? Well I’ll tell you: Having an attached level to make sure your stencil is straight! Yes, Cutting Edge Stencils has come up with this brilliant Clip-On Stencil Level which makes placement a breeze. You can attach it to the bottom of your stencil when working up high, and simply remove and reattach to the top of your stencil when painting the lower parts of your wall. Janna demonstrated the proper amount of paint you need to stencil, which is not much at all. Once your roller is covered in paint, simply roll it several times on clean paper towels to remove lots of the paint. You want a very light coating of paint on your roller, so as not to glop (technical term!) the paint onto the wall. Remember: it’s easy to add paint, but not so easy to remove paint! Simply roll on the paint over the stencil. You shouldn’t have to press hard, and your initial passes over the stencil will get more paint onto the stencil than the wall itself. 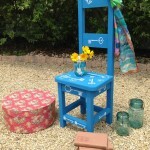 You can find many tips for stenciling on the Cutting Edge Stencils website, along with How to Stencil videos as well. See the large “dots” on the outside of the stencil above? Those are not only part of the design, but also your handy guides to match up the stencil easily as you move it to the next section of your wall. Each of us got to try our hand (pun intended!) at stenciling. I went first, and Greg and Janna had me begin with removing the stencil from the wall and placing/attaching it to the next section. It was easy to match up the stencil using the circles as guides. Another tip? Don’t paint over those particular circles again, as then they will have two coats of paint whereas the rest of your design has one coat. I think my section turned out well! There’s some unevenness in how I rolled on the paint, however I really like the somewhat faded look! Every one of us had our cameras and smart phones out, documenting as much of our day as we could! Here’s part of the wall (on the left, below) that we stenciled. Notice how the left edge is bare, as is the top of the wall? Well, the Charlotte Stencil comes with an extra top piece that takes care of this. You can see the difference in the “after” picture on the right. It looks much more like wallpaper, doesn’t it? I love how just adding that little bit completely finishes off the design. Greg demonstrated how to use this top piece. Simply match it up with the circles as your guides, tape it to the wall, and stencil with your roller. As you get toward the top of your wall, you can switch to a stencil brush to get into the uppermost section. Each of us came up with several ideas on how we wanted to use the Charlotte Stencil. I would love to use the center portion on top of our round table in our breakfast room. I think it would look so pretty. How would you use this stencil? You can enter to win a Charlotte Stencil right now over at the Cutting Edge Stencils blog. How cool is that? Plus while you’re there, you can see more pictures from our visit too! Come back on Thursday, when I’ll share with you how to stencil a simple canvas tote bag like the one I stenciled above. 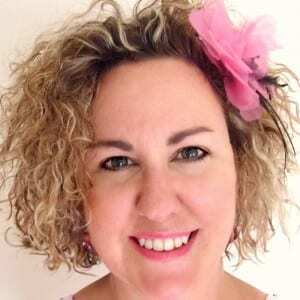 Special thanks to Kelly of Eclectically Vintage and Miriam of Hometalk for organizing such a fun Bloggers Day Out, complete with the Hometalk hats each of us received! Extra special thanks to Janna and Greg and everyone at Cutting Edge Stencils for their hospitality, the hands-on workshop, and for the awesome stencil supplies! All opinions are most definitely my own. Wow – so many pics to pour over which is amazing since the day seemed to fly by! I had so much fun meeting you Laura – you are amazingly funny and fabulous! Here’s to many more outings in our futures! Yeah I know – I took so many pics, and I know this post is image heavy, but I couldn’t figure out an easy way to split it up. 🙂 I had a blast meeting you as well, and definitely look fwd to more outings! Just saw Cutting Edge Stencils link on Twitter of this post, very cool! Looks like a lot of fun. Wish they had a blogger meet up in Houston. Cute tote! Glad you found your way here, Jody! 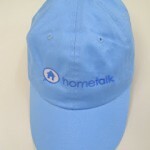 You should check out Hometalk, as there’s many bloggers from Texas and no doubt they’ll be planning some meet-ups too! <3 It was such a blast being there, but being there with YOU made it even better girlfriend! So glad we got to giggle like school girls and HUG in real life finally! Yes, I agree that finally getting to hug you – and to thank you for all of your help with my Socks for Sandy project – was long overdue! And giggling is good for the soul! This is awesome! I would love to have a huge table like this in my craft room. 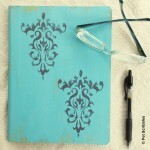 I have been picking up stencils to utilize with my DIY projects and cards. Thanks for sharing your experience. Oh my, how fun!!! I am super jealous that I don’t live near all you awesome women. The stencil wall is gorgeous. I must try that. Thanks for sharing. I can’t wait to meet you at SNAP!!! Johnnie – I’m a total convert into stenciling walls since my visit to Cutting Edge Stencils! Actually, I want to stencil everything – even my cats aren’t safe right now! 😉 SNAP will be here before we know it, and it will be FUN! I’ll return the envy factor this Summer, hopefully! 😉 Yes, the dandelion stencil is fantastic. You were there in spirit, laughing at all my jokes! What a fun day. Looks like you girls had a great time. Thanks Ahrisha – yes it was a fantastic mix of meeting everyone in person and getting some hands-on stenciling instruction from the experts at Cutting Edge. Couldn’t have asked for a better day! Great! What a fun trip! It was a super fun day and it was awesome meeting you, Laura! I can’t wait to do it again! Thanks for sharing your recap. Looks like a great time! What fun! So sorry to have missed it and meeting you! 🙁 Love Cutting Edge Stencils too! I was sorry you weren’t able to join us too, Roeshel! 🙁 Here’s hoping we will connect in person soon!